Can’t leave home for a while? Can’t travel to Alaska, Hawaii, or Costa Rica? 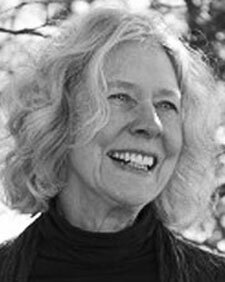 Then read these lyrical, sensual poems by Peggy Shumaker, who, we’re thrilled to say, will assume the role of Persimmon Tree’s poetry editor after this issue! “So iridescent is Shumaker’s language,” notes Alice Friman, that she takes us right “there.” These are poems that, as Jane Hirshfield has said, are “vibrant with seeing, quickened with soundwork, subtled by insight.” They give us “new ways of seeing familiar objects” with “extraordinary” juxtapositions, according to Libbie Martin. They also bring, I would add, the unfamiliar right into our own back yards. Shumaker was born in La Mesa, California, but grew up in Tucson, Arizona, earning her B.A. and M.F.A. from the University of Arizona. She has served as writer in residence for the Arizona Commission on the Arts, working with prison inmates, honors students, gang members, deaf adults, teen parents, little kids, library patrons, and elderly folks. She has given readings in as many locales as we see in her poems, from abandoned banks to libraries and bookstores to reservations. Her poems and nonfiction works have been published in Russia, Japan, Australia, New Zealand, Canada, England, and throughout the United States. Her numerous books include Esperanza’s Hair (University of Alabama Press, 1985), The Circle of Totems (University of Pittsburgh Press, 1988), Wings Moist from the Other World (University of Pittsburgh Press, 1994), Underground Rivers (Red Hen Press, 2002), Blaze, with Kesler E. Woodward (Red Hen Press, 2005), Just Breathe Normally (a memoir,University of Nebraska Press, 2007), Gnawed Bones (Red Hen Press, 2010), and Toucan Nest: Poems of Costa Rica (Red Hen Press, 2013). Cairn, her new and selected collection, will be published in 2018. In 2008, Shumaker founded Boreal Books, an imprint of Red Hen Press, to publish literature and fine art from Alaska. She has also been editing the Alaska Literary Series. She was awarded a National Endowment for the Arts Fellowship in Poetry, and has served as poet-in-residence at the Stadler Center for Poetry at Bucknell and as the president of the Board of Directors of AWP. She was the Rasmuson Foundation’s Distinguished Artist for 2014, the Artsmith Artist of the Year for 2014, and was Alaska State Writer Laureate for 2010-12. She is Professor Emeritus at the University of Alaska, Fairbanks, and teaches in the low-residency MFA Rainer Writing Workshop and at many writing conferences and festivals. Bringing us the movements of a fox on Alaska’s Chena River, the surroundings of a koa tree in Hawaii, and a sloth’s movements in Costa Rica, the poems we’ve featured by Peggy Shumaker will give you a small but vivid slice of this poet’s wide-open, breathing, moving, vivid, all-inclusive world, and we hope they take you right there!